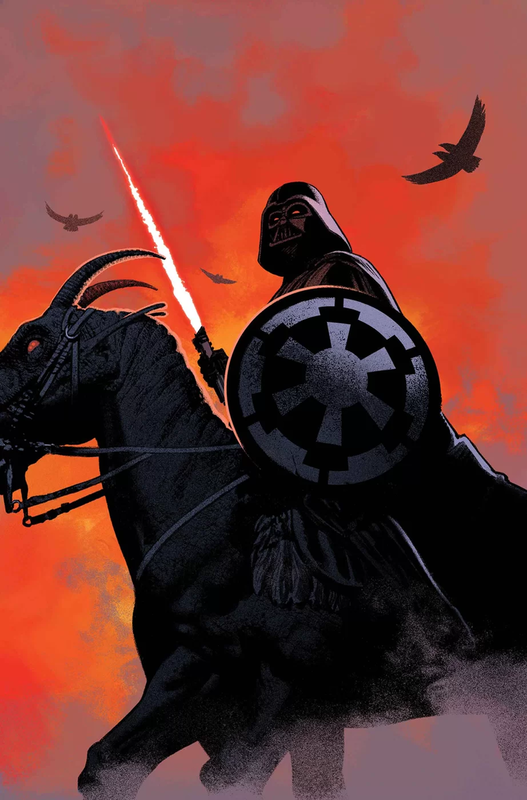 Vader – Dark Visions #1 kicks off a new mini-series focusing on Darth Vader. In this issue, we see a different version of Vader – savior. While it was not Darth Vader’s intention to be the savior of an alien species, nonetheless, that is the outcome, and it makes for an interesting story. It all takes place on a planet called Cianap. The locals all live underground for most of the year and only come up during the time period they call slumber. That’s when the forage and scavenge for food. You see, they live under the tyranny of a harsh god, and when the god sleeps, it’s safe for them to roam the surface of the planet. But when the god wakes, they must seek refuge underground. They call the god the Ender. One of the locals notices a battle being waged in the sky between other gods. A fireball falls to the surface and reveals a dark knight with a sword of fire. This is of course Darth Vader and he ends up waking the Ender and fighting the gigantic monster. The comic does a great job of playing out the epic fighting. The artwork has some nice panels showing off the battle, and it’s a well done presentation. In the end, Vader is victorious and leaves on a Star Destroyer. But the natives stand in awe as the tyrannical god they lived in fear of is now dead. To them, Darth Vader is a savior who has freed them. As a story, it’s a fun little side tale with some great action showing Vader fighting some giant monster. Yet the more interesting aspect is Vader the hero. He did not set out to do a good deed, and yet he saved an entire world. How does that act of good weigh up with all the bad he’s committed? What other acts might he have done to offset his evil deeds? It’s a fun path to travel down, and for opening it up, I give Dennis Hopeless big points. With a fun story, good artwork, and some interesting impacts to the larger universe, I give Dark Visions #1 a four out of five metal bikinis.